Thousands of Italian doctors and airline pilots are staging a one-day strike. Planned operations were cancelled as 150,000 health staff walked out, and national carrier Alitalia cancelled nearly 160 flights. The protests are against labour and pension reforms being introduced by Prime Minister Silvio Berlusconi. The plans have sparked a wave of strikes and protests, and have become bogged down by in-fighting in Italy's squabbling coalition. The health staff are protesting against budget cuts and pay freezes. The strike by doctors, surgeons, chemists, biologists and administrators left only emergency care and family doctors in place. Vets also walked out. 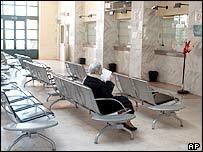 The strike was expected to force the cancellation of 90,000 planned operations and 600,000 specialist appointments. The pilots' strike, meanwhile, left some tourists stranded in Rome, as 99 domestic flights and 60 international ones were scrapped. The pilots are also angry at pay freezes, and at plans to shed more than 2,500 jobs. Both sets of workers - along with judges and magistrates angry at judicial reforms - are threatening further action in the coming weeks. The action puts fresh pressure on Mr Berlusconi, already battling ongoing tension in his fragile coalition government and facing a renewed trial on corruption charges. His battle with the judiciary took a new twist at the weekend, when the secretary of the national magistrates' union launched a strong attack on his administration. "Those who govern today, govern not on a system based on the rule of law but on a system based on the rule of the strongest man," said Carlo Fucci. The union's chairman said the comments were Mr Fucci's personal views.